After the demise of the W-type trolleybus, the Karrier name remained dormant until the Rootes Group revived it for this compact little 14-seater coach. It was clearly based on Commer units, and according to John Gillham’s ‘Buses and Coaches 1945-1965’ used a 4-cylinder petrol engine. It appears to have been marketed as a complete vehicle with Reading bodywork from the outset. No chassis type is indicated. This example was owned by the Formby Coach Company, although this was clearly not its original owner, as it has a Coventry CBC registration. I have no information about its previous owner(s); the name in the nearside destination opening is indistinct but could be either Bibbys or Kirbys. The shot was taken in January 1967 at the corner of Lancaster Road and Church Street in Preston, known locally as Starkie’s Corner from the clothing store behind (these words can just be made out on the corner window above the prominent ‘SALE’ sign). Note also the three Preston Corporation deckers in the background, all in the older maroon livery. The building with the clock is the Transport Department offices. Thanks for posting, Alan. There is still a Formby Coaches (based in Formby) appearing on the web, although it probably isn’t the same one. 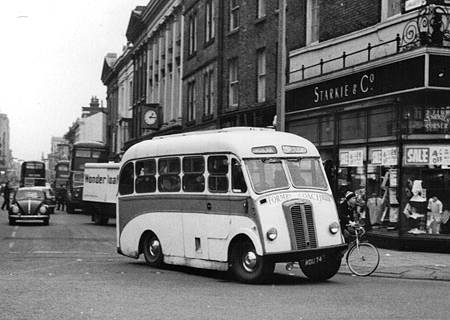 Looking at the background, don’t those Preston buses in the old livery look dismal? The blue and cream gave a much-needed boost to the impression. And a WONDERLOAF delivery van – remember??????? This is lovely ‘action’ photo (leaning round the corner) of a Karrier Q25 chassis and an early Reading body of the type called Lilliput. It was exclusively built on Karrier chassis and ‘Karrier/Reading Lilliput’ was a registered trade mark. They were made throughout the fifties and sixties and sold to many well-known companies such as Frames Tours, these examples looking outstanding! The GPO ordered a lot of (modified) ones for outside broadcasting duties. I recall them well in this role. They were a nice little earner for Reading – the cost of them as luxury coaches at that time was around £1250! Many thanks for the very complete expansion of the details of this – in my opinion – rather neat little vehicle; I was a bit frustrated by the rather scanty info in JCG’s book, although at least there was something there to work on. I also have a photo of a similar combination, but clearly of later date, with the horizontal grille, with Safeway of South Petherton (600 GYC). Presumably that would have been marketed under the Lilliput brand as well? Reading was very much into producing bespoke bodies and Lilliputs came in all shapes. Plaxton was another company who built bodies on the Karrier chassis, but I think that the Karrier/Reading partnership had a large market. The photograph of Karrier/Plaxton 2677 NW of T.H.Parkinson of Heckmondwike reminded me that the vehicle in question was painted lemon yellow and later it was replaced by a newer model painted blue. Besides running the coaches the firm ran taxis and were booking agents for West Riding for the daily service from Wakefield to Blackpool that passed through Heckmondwike. Further to my earlier posting of 2677 NW. Bruerian mentions on his Flicker Postings that in fact the registration number was in fact 2677 WW. There is probably a grain of truth in this. NW was a Leeds registration and a vehicle registered in Heckmondwike would have been registered in the West Riding of Yorkshire which had their offices in Wakefield. It would appear Plaxton made a mistake on their official photograph.